Fasten your seatbelts for an anthology of turbulent tales curated by Stephen King and Bev Vincent. 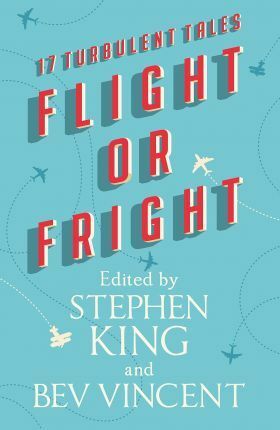 This exciting new collection, perfect for airport or aeroplane reading, includes an original introduction and story notes for each story by Stephen King, and brand new stories from Stephen King and Joe Hill. Welcome to Flight or Fright, an anthology about all the things that can go horribly wrong when you're suspended six miles in the air, hurtling through space at more than 500 mph and sealed up in a metal tube (like - gulp! - a coffin) with hundreds of strangers. All the ways your trip into the friendly skies can turn into a nightmare, including some we'll bet you've never thought of before... but now you will the next time you walk down the jetway and place your fate in the hands of a total stranger. Book a flight for this terrifying new anthology that will have you thinking twice about how you want to reach your final destination. STEPHEN KING is the author of more than fifty books, all of them worldwide bestsellers His recent work includes Sleeping Beauties (co- written with his son Owen King), the short story collection The Bazaar of Bad Dreams, the Bill Hodges trilogy End of Watch, Finders Keepers, and Mr. Mercedes (an Edgar Award winner). Many of his books have been adapted into major films, TV series or streamed events including The Shawshank Redemption and IT.. He is the recipient of the 2014 National Medal of Arts and the 2003 National Book Foundation Medal for Distinguished Contribution to American Letters. He lives in Bangor, Maine, with his wife, novelist Tabitha King. BEV VINCENT is the author of The Dark Tower Companion, The Road to the Dark Tower, nominated for a Bram Stoker Award, and The Stephen King Illustrated Companion, which was nominated for a 2010 Edgar (R) Award and a 2009 Bram Stoker Award. He is a contributing editor with Cemetery Dance magazine.